We are delighted to interview the talented artist Margot van Huijkelom here! 25 years ago she left Holland for France to discover the world of Parisian elegance that influenced her work. 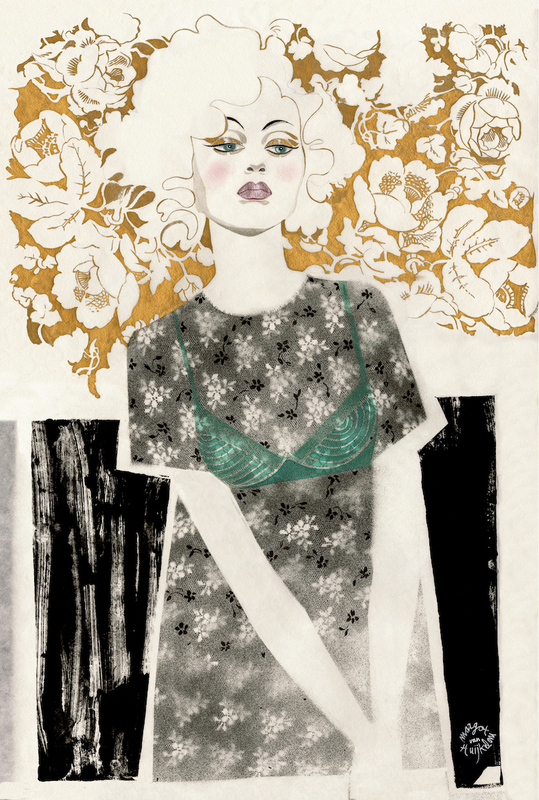 Her exceptional fashion illustrations are combining a sense of femininity, strength, attitude and haute couture. Hi Margot great to have you here! I’m living and working in an artist village on the south of Paris. I knew from the time I was 6 years old that I wanted to become a fashion illustrator and painter. As a child, my best friend and I would feverishly create fashion magazines filled with our illustrations and sell them in our neighborhood. Atelier Wall with her "girls"
I’m using multimedia with a predilection for the association of abstraction and precision, interlacing pencil line with watercolor, combining transparent Areo-spray with opaque oil paint or pigments with liant. with all the techniques that I’ve appropriate myself during all these years I have the choice to pick the most adequate medium to express myself. "I take pictures of everything I see and that is inspiring me, my daughter’s expressions, the frost in the forest, people passing by, the haute couture shows, a waving skirt… I’m sketching them and hang them on my mood board as a huge patchwork of ideas. I will choose a sheet of handmade paper with it’s subtil grain and prepare my mediums. Than I will experiment with all the vibrant pigments and mediums that I could use to express the essence of the subject. I will study how delicate brushstrokes could be combined with textures on the handmade paper. But before starting to apply I will scratch away and grasp my brushes before grasping the character, Immersed in a concentration bordering on meditation. Because if my line deviates one millimeter I have to throw that drawing away…"
“It’s in Tokyo where I was introduced to a discipline that became a strong source of inspiration for my work—the art of woodblock printing ( Ukiyo-e) with it’s delicate work of fine lines on handmade paper. I’ve worked for 15 years for a Japanese company in Tokyo .The boss of the company ( named Shacho = boss in japanese) showed me one day his private and rare collection of woodblock stamps such as Hokusai ( the wave) and Utamaro but also the work of one of my favorite artists called Leonardo Foujita. Shacho noticed my extreme interest in his collection so he got me on a taxi that dropped me at an art supply shop in Tokyo where I could find the most outstanding pigments and handmade paper. This is where it all began." Besides my beloved years working with my clients in Japan, the most exciting is drawing for the Journal le monde exclusively during haute couture fashion week in Paris. Working with Valentino and Dior, among other Couture houses, being one of the lucky few to have to freedom to walk around at the backstage during the runway shows. 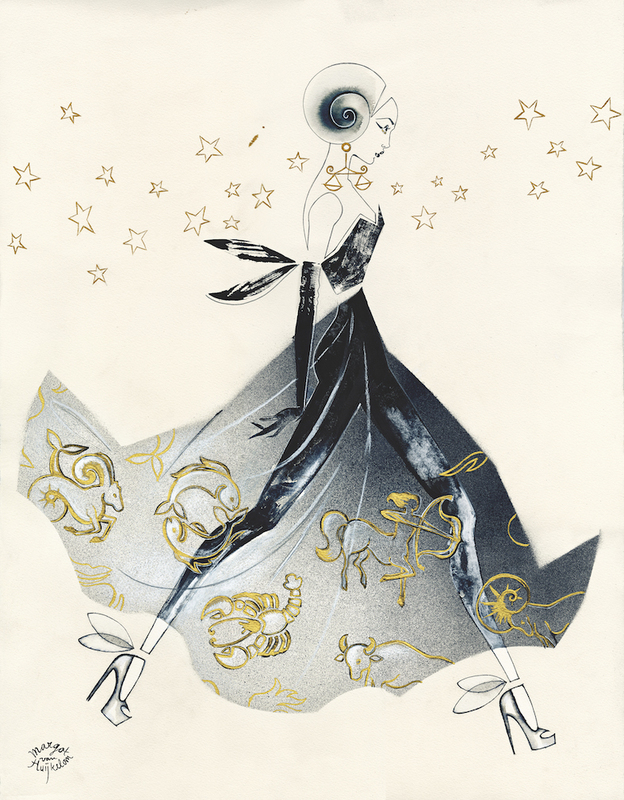 After the shows, I had to go back home each day to finish the fashion illustrations on a very tight deadline. They were to be published the next morning, which demanded me to finish my fashion illustrations before 5am. 8. Name 3 things you can’t live without? A great thing for me in 2018 is that Taschen re-edited « Illustration fashion Now» and I’m very happy to be in it again. The book is distributed worldwide and it’s a great reference. I’m continuing to create drawings for Harrod’s Magazine and I have many different projects and clients that I bring with me into 2018. Also I’m working on my upcoming exhibition that is really exciting but unfortunately I can’t talk about it yet! Most important is to believe in yourself. I have been seeking for years to finally realize myself that I knew it already when I was 6. It is very easy to get lost in this cyber world, be inspired by the real things that are happening in front of your eyes and go out and chase 3-dimensional experiences instead of focalizing on what others create on the flat screen. Go and see, taste, feel and keep close to you intrinsic values and beliefs, stay close of what you really are.